I am interested in what other hybrid changes people have made to their hives to deal with their local climate or other issues. I will post pictures soon. 2" timber is going to make a very heavy hive. I would suggest 1" plus some lightweight insulation - but that's just me. The problem with all of the insulation I have looked at is breathability. While 2x will add considerable weight, it provides both the insulation and somewhere for the moisture to go. I live in a place where it is very cool and damp from November-March. This is incredibly hard on the bees because they're trying to reduce humidity in the hive and the moisture promotes all sorts of nasties growing in the hive. Have a look at the CDB hive. It was designed for wet and windy Ireland. The way the lift is designed is very clever. It is a second wall over the brood box for winter and, when inverted, provides a box above for supers during the summer. The cavity between the walls can be stuffed with insulation in the winter too. It is a frame hive in its original design, which I think is what you wanted. I've been wondering too how best to incorporate insulation. For the moment I'm using wbc style lifts over my warre boxes with the cavity stuffed with straw. The problem with all of the insulation I have looked at is breathability. While 2x will add considerable weight, it provides both the insulation and somewhere for the moisture to go. Wood isn't really 'breathable'. Untreated wood will absorb a small amount of moisture, sure, but once it has saturated and swelled accordingly, that's it - it'll then take a very long time for that wood to dry out. Ask anyone in the firewood business ! The amount of moisture to be removed from a hive during the year is truly phenomenal: I posted some 'back of fag-packet' figures a while back - a few gallons per hive, IIRC, but Phil was of the opinion that I was being too conservative, and that in practice it would be much more. We're talking about a LOT of water needing to be removed. Suggest you investigate 'breathable' insulation such as Rockwool, natural wool, straw - any of those fibres which allow a very gradual but constant movement of moisture-laden air to migrate through them. Also, do bear in mind that moisture-laden air will move upwards of it's own accord, as it is lighter than dry air. CDB Hive: The way the lift is designed is very clever. It is a second wall over the brood box for winter and, when inverted, provides a box above for supers during the summer. Now that is a VERY clever idea ! Wood certainly is breathable. It's moisture permeability is exactly how firewood dries. The moisture moves through it as the air wicks it away. Bark is a water proof skin that keeps water both inside and outside the tree. This is why logs need to be split to dry as quickly as possible, to open up more permeable surface area. From a 60/80% water tree, it dries down to 10% or so, which is the stuff you build your hives with. It won't then become resaturated outside unless you leave it sitting in water. It's been raining here all morning until an hour or so ago and the unpainted walls of my hives look dry already. The bee escapes in a CDB or WBC are also there at the top to let the warm moist air out. I wouldn't describe the ability to wick moisture away at the 'firewood dying rate' as being 'breathable' - certainly not when you consider the rate at which water needs to be removed from the hive. A further phenomenon often overlooked is that as the hive matures, the walls will gradually become coated with a layer of propolis, thus rendering the walls more-or-less impervious to moisture. The rate green wood, at 60-80% wet, dries is not at all the same thing as the rate dry wood dries after contact with rain, or the rate moisture wicks through dry wood. Hive walls are also vertical or near enough so the water is mostly shed by gravity anyway. The walls are also thin, unlike logs. So not the 'firewood drying rate' at all. What I do agree with you on though is what you said about propolis. I would be interested to know how much a tree absorbs any moisture from a hollow within it. There too though the bees would propolize the walls. Hives are not trees though and do not actively regulate the moisture within their own walls, which is maybe why breathability or ventilation is a question for hive design - for insulated or cavity walled hives at least. 'Breathable' is normally used in the sense of "allowing air to pass through" or "porous". Thus it would follow that 'breathability' is the measure of a material's ability to allow gases (in this case moisture vapour) to pass through it. I simply cannot see how wood can be described as a 'breathable' material, when water vapour (water in it's gaseous state) does not actually pass through wood. Water is absorbed as liquid at one surface, sure, and expelled at another surface as vapour - but water vapour (as the gas) does not itself actually pass through between the wood fibres - certainly not in the same unchanged and relatively unrestricted way as water vapour passing directly through GoreTex, cotton, wool, straw, RockWool, and so many other materials. 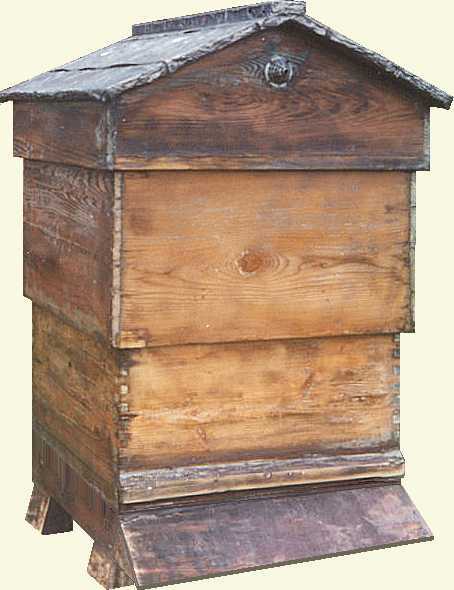 If a hive needs to expel (say) 5 gallons of water in a season - is it realistic to suggest that this amount of water could possibly pass through the wooden walls only of a beehive - with all the other orifices carefully sealed ? I think not - and it is with this specific scenario in mind that I am saying that wood cannot really be considered - in this particular context - as a truly 'breathable' material. Whereas wool, straw etc, certainly can. You may well be right about that being the correct meaning of breathable. I suppose I'm coming at it from the use of the term to describe how lime renders + plasters and breathable paints allow moisture a way out of the damp walls of old houses, rather than it being trapped behind cement renders or plastic paints. As to the water passing only through the walls of a wooden beehive, I wouldn't and didn't suggest that. Nor would I suggest that it would all pass into the interior walls of a hollow tree, but I am interested to know if any does. I don't know how you got that 5 gallon figure, but if this has already been discussed elsewhere did you factor in what water bees might need to consume individually for their own sustenance? I haven't read anything about this, but I had wondered whether that might be part of the honey drying process. The removal of water from nectar and subsequently from the hive has indeed been discussed at length, and - inasmuch as any conclusions were drawn - at least Bernhard and I believe that condensation accounts for a good deal of it, while some may well be physically removed as water by emerging bees and dumped outside. Water evaporating from the walls of the hive would have a cooling effect, which would benefit the condensation process somewhat, but if the walls are properly varnished with propolis, then very little water vapour would escape by this route. So even if wood is porous (which - especially in the case of a living tree - I doubt) the vapour should not be able to travel outwards through even a thin layer of propolis. the vapour should not be able to travel outwards through even a thin layer of propolis. Which is the interesting thing, to me at least... It's as if the bees want to seal in as much moisture as possible. But that's one side of the wall. Going back to the OP's raising of breathability / moisture transfer in the first place, it was the problem of insulation and breathability that he was talking about. My understanding of what he meant was that he didn't want to create a mouldy and wet atmosphere by sealing in moisture with insulation. Wet wood that can't expel the wetness will rot.